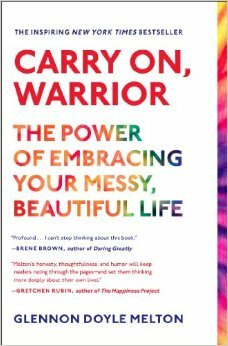 Carry On, Warrior: The Power of Embracing Your Messy, Beautiful Life by Glennon Doyle Melton, Scribner, 2013, 300 pp. I have a significant number of friends, drawn from both clergy circles and mom circles, who are huge fans of Glennon Doyle Melton and her Momastery blog, almost like fangirls with their level of devotion and *squee*. Although I’ve been reading Momastery for a long time, I’m not in that camp. I’m not generally one to go fangirl anyway, and Momastery never tempted me. I admire Glennon Doyle Melton and her mission of connecting people together. Her blog regularly makes me draw in a sharp breath in recognition, or moves me to tears, or makes me feel heard and understood, or says something I want to say in a way that is much more clever. To be honest, even though I know Melton sees a much more inclusive vision, it sometimes felt too much like #whitepeopleproblems, a place for suburban, white and wealthy moms absorbed in their own struggles. Her writing annoys me sometimes, so much so that I can’t even make it through a blog post because of ALL THE CAPITAL LETTERS. So, I didn’t reach for Carry On, Warrior right away. I knew it was important to read it, that I would find some great things inside, but I also felt like it might give me a headache. I was wrong. Because it’s a book and not a blog, Carry On, Warrior is edited. That means it’s all the best, most wonderful stuff from Momastery, refined and honed into greater beauty. Glennon Doyle Melton is a good writer, and I suspect she had a good editor, because what emerges here is a stronger, clearer and more compelling voice for Melton, but one that remains uniquely hers. It’s still raw, not polished; authentic, not packaged. She’s become a much better writer, and what I found in Carry On, Warrior is a beautiful memoir of faith and hope. It’s only fitting that Melton, whose best appeal is her vulnerability about her own struggles, lives that story again as a writer. This isn’t a mess, it’s a beautiful, humorous collection of essays on life and love that reveals the holy in all our mess. Melton tells stories from her brutiful life (beautiful + brutal, a term she coined), and invites us to see where God is present in them and in our brutiful lives. She covers her journey through addiction recovery and an eating disorder, the ups and downs of marriage and parenting, and finding faith and family. She has a straightforward way of explaining things using everyday metaphors that is deceptively simple. Her observations seem obvious, until you consider them for just a moment and realize their power. It’s a skill like Jesus, taking ordinary stuff and imbuing it with holy meaning. Also like Jesus, at every turn she offers glimpses of beauty and hope. I guess I probably sound like a fangirl now, against my will. Below are some of my favorite examples, to get a sense of the power of Carry On, Warrior. Here, in an open letter to her son, she tackles two of the most divisive questions among Christians today, the interpretation of scripture and what it means to be born again. Suddenly, all those divisions seem to fall away. Much of the Bible is confusing, but the most important parts aren’t. Sometimes I wonder if folks keep arguing about the confusing parts so they don’t have to get started doing the simple parts. … If a certain scripture turns our judgment outward instead of inward, if it requires us to worry about changing others instead of ourselves, if it doesn’t help us become better lovers of God and life and others, if it distracts us from what we are supposed to be doing down here–finding God in everyone, feeding hungry people, comforting the sick and the sad, giving whatever we have to give, and laying down our lives for our friends–then we assume we don’t understand it yet, and we get back to what we do understand. Chase, what we do understand is that we are reborn. She comes head-on at one of my favorite topics, the importance of church in Christian life. With this book, Glennon Doyle Melton has moved well past the title of “mommy blogger,” and become a writer whose truth-telling cuts through the noise and gives voice to the presence of God in the midst of our everyday lives. I have flags in three pages already, with plans to use quotations for upcoming sermons. This is after already developing an entire sermon on her principles (We Can Do Hard Things) just a few weeks ago. I look forward to reading much more from her in the future. 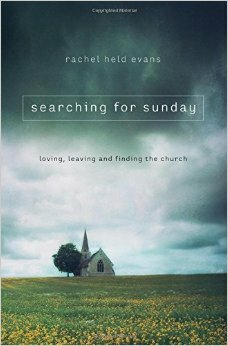 Searching for Sunday: Loving, Leaving and Finding the Church by Rachel Held Evans, Nelson Books, 2015, 269 pp. I am enormously grateful for the voice of Rachel Held Evans and the contribution she makes to the contemporary conversation about what it means to be a Christian, to be a church, to love God and live as God intends. For me, she is added to a growing list of authors whose work gives a fresh eloquence to ancient questions, people like Rob Bell and Nadia Bolz-Weber. 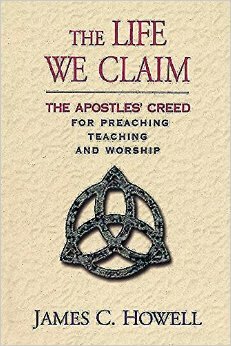 When I read their books, I never feel like I am reading anything monumental as a new idea or paradigm-shattering concept, but instead I find a new generation voicing the ancient-yet-always-new vision and theology at the core of our Christian faith. I know that for some people, these authors rock the boat and rock their world. That’s not the case for me, though it doesn’t make me any less of a fan. It’s as if someone gives eloquent voice to what I’ve been thinking for 20 years already. I’m indebted and grateful to these authors for giving me a way to share this with others, whether those whose boats need rocking, those who’ve already sprung a leak, and those feeling about to drown. Searching for Sunday offers a refreshingly life-affirming take on the traditional seven sacraments of the church: baptism, confession, holy orders, communion, confirmation, anointing of the sick and marriage. Evans made the journey out of fundamentalism and found a new home in the Episcopal church. This book traces that evolution by placing her personal stories in sacramental context, tying these holy acts to the ordinary elements of our lives. I loved the way she makes these holy mysteries accessible and interwoven with the water, bread, hands, sins of our lives. Mostly, I love her prose. It’s not the major, overarching insights of the book that draw me–it’s the minute crystals of light that she captures, phrases and ideas I want to remember and revisit for preaching and teaching the future. Here are a few of my favorites. If you are looking for words to describe how God is alive in the church, ancient and new, Rachel Held Evans points the way. She reclaims the historic witness of the church and places it squarely in the middle of our 21st century mess, and sees where God is alive and moving among us. Her words give me words to claim faith anew. A meditation delivered at the Downtown Jeffersonville Lenten Services, hosted by Wall Street United Methodist Church, based on Joel 2:12-17. I fell in love for the first time when I was 22 years old. I’d had plenty of dates, little crushes and infatuations, romances that lasted awhile here and there, but I’d never fallen in love. I was out of college, working two jobs just to rent a crummy little apartment at the beach with a roommate, and hanging out with a bunch of her old friends from high school. He was her friend and became mine, and then we fell for each other, pretty fast and pretty hard. I would go to work at 7:30 every morning and return home at 10:30 every night, and still find time to spend hours talking on the phone or hanging out in the late-night diner, just to be together. I couldn’t stand the idea of being apart, and even hanging up the phone felt like torture. I wanted to share every moment together, every little detail of our days. If you’ve ever fallen in love, you know just what I mean. They don’t call it heartache for nothing. I remember one particular day. We were hanging out at the crummy apartment, doing nothing special, and I saw him sitting across the room when the thought ran through my mind: “you’re gonna break my heart someday.” I wasn’t accusing him or anticipating anything in particular—but I realized in that moment that someday, some way, by death or by life, something would tear us apart, and I would never be the same. When it came to breaking my heart, he already had. Not because he had mistreated me or stopped loving me or ended the relationship—but because the love I felt for him had broken open my heart, and it would never be the same. We’ve been married almost 18 years now, and the guy still breaks my heart, more so than ever, because that’s what it means to love—to have someone break into your heart and break it open, to plant themselves in your heart such that losing them, or being apart from them risks shattering your heart altogether, leaving a big, bleeding, broken-hearted hole right in the middle of your chest. It’s not romantic, it’s not a statement about the status of our marriage (which is not especially blissful), it’s just the truth—love breaks your heart, whether that love lasts forever or only for awhile, whether by life or by death, love breaks your heart. We have a child now. I still remember the first time I left him at home alone with his father, my first love. He was maybe 3-4 weeks old. I just ran up to the grocery store for a few minutes. I trusted my husband completely to care for him, and I knew in my mind that everything would be fine. Still, I cried the whole way there and back. My heart just ached for his little self. He hadn’t done a thing except make my body hurt and kept me up at night and created lots of laundry, but the kid had broken my heart, and I couldn’t bear to be apart from him. That’s what it means to love, to let someone break into your heart and break it wide open. “Rend” is an old fashioned word. We don’t use it much anymore. “Tear” doesn’t quite capture its meaning—when you rend something you tear it violently, you rip it apart and shred it into bits. Rend your hearts, God says. God is asking us for broken hearts. 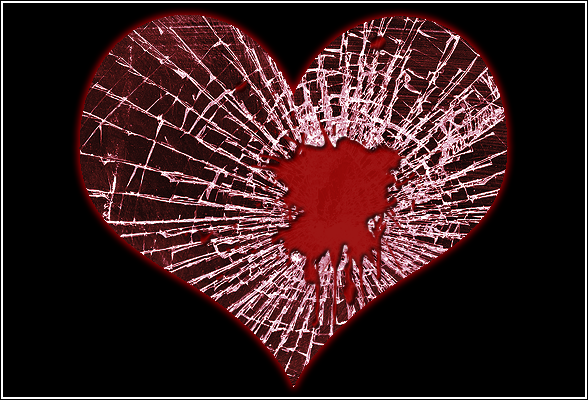 We sometimes think that broken hearts are a side-effect of sin, that they are a sign of life’s brutality and our estrangement from God and from one another. But that’s not quite right. In the Bible, it’s clear that sin doesn’t make our hearts broken, it makes them bitter. 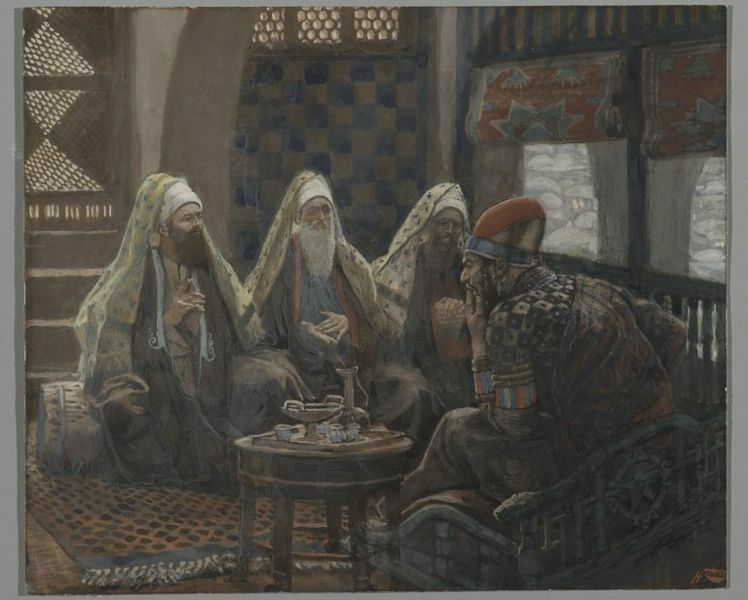 From Pharoah to Philistines to Pharisees, God’s enemies are described as hard of heart. These hard-hearted ones are those who freeze out kindness and calcify against compassion. The real danger to our hearts is not that they will break, but that they will be unbreakable, that they will be hard as stone, so that they cannot be rendered unto God. “Rend your hearts,” God says. Break your heart open for me, so that love can come in. Some people would argue that God is the one that does the breaking—that God afflicts us with loss or separation, death or destruction in order to break us open, teach us a lesson, or somehow improve us. That’s not true either. God doesn’t kill the ones we love or send plagues upon our houses or blow fierce winds of devastation upon us in order to make us more faithful. God cannot compel our love any more than a spurned lover can. God’s love remains unrequited until we return it. The words in Joel are not proclamation of what God will do, they are plea for what we should do. In her book about her brother dying from AIDS, Susan Wiltshire compares a broken heart like a broken biscuit. “When it’s torn in half, there is twice as much surface on which to spread the butter and honey.” (Dan Moseley, Lose, Love, Live, 18) Picturing the broken biscuits dripping with warm butter and sweet honey at the breakfast table takes me to another table–the Lord’s Table, set for holy communion. We take that whole, perfect loaf and break it, rip it apart, shred it into tiny pieces, so that everyone who comes forward can receive the taste of Christ in broken bread. 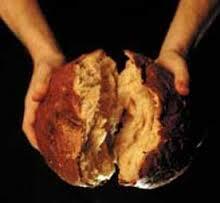 The broken bread stands in for the broken body of Christ on the cross. That word “rend” appears again at the cross in Matthew’s Gospel. It’s what happens to the temple curtain at the moment of Christ’s death—the curtain is rent in two, from top to bottom, as the earth quakes and the rocks split open, because the very heart of God has been broken open with love for you and me. “Rend your hearts,” God says. Break your heart open for me, so that love can come in. “Return to the Lord your God, for God is merciful and compassionate, very patient, full of faithful love, and ready to forgive.” Break your heart open for God, because God’s heart is already broken open for you. This past Sunday was Pentecost, the day we commemorate the arrival of the Holy Spirit as described in Acts 2, a day often called the birthday of the church. It’s one of my favorite stories in all of scripture. The drama of the wind and fire, the many voices speaking the good news of Christ, the power of Peter’s preaching, the crowds moved to follow. Inspired by this wonderful article by my colleague Rev. Emily C. Heath, I started thinking about what it meant to be a Pentecost Church. I want to be part of a ministry as vibrant and alive with the Holy Spirit as that second chapter of Acts. 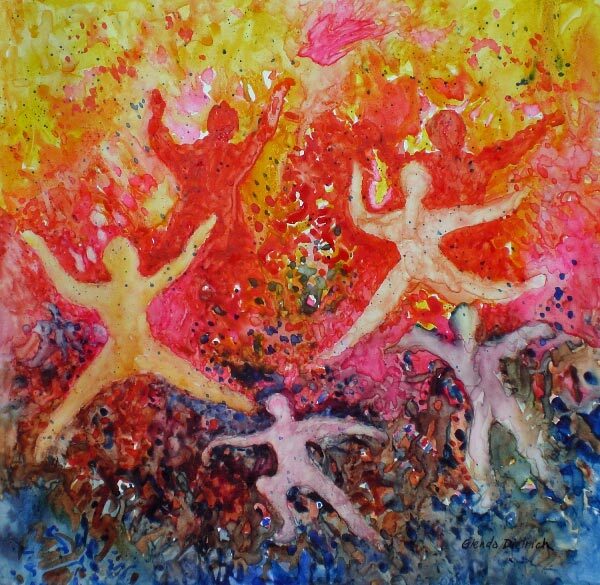 What happened at Pentecost, and can it happen in our churches today? Can we carry on the spirit of the Spirit? What would be the marks of such a congregation, a Pentecost Church? 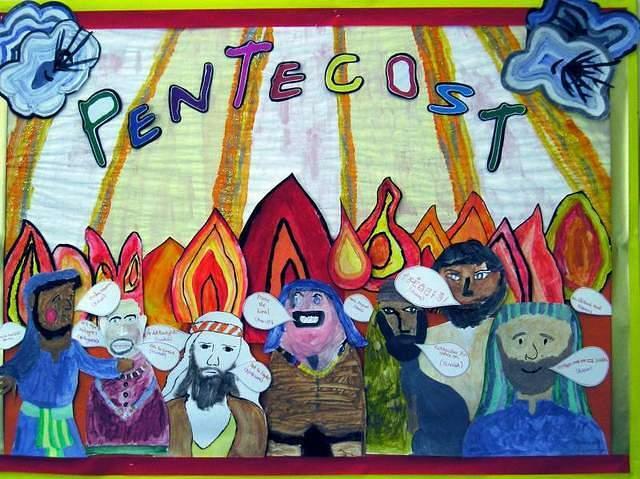 Drawing on that original story in Acts, I’ve identified six marks of a Pentecost Church. These are elements of a church alive with the Holy Spirit, and could describe any church that aspired to embody them. 1. A Pentecost Church is touched by the Holy Spirit. A Pentecost Church actually believes the Holy Spirit is alive and moving among the congregation. They anticipate that God will show up and do something to them and through them that will amaze and inspire. This seems obvious, but I’ve been in plenty of churches that expect very little of the Holy Spirit in their worship services. Some churches even act as though they are hoping the Spirit in her wildness doesn’t show up, because it might mess with their plans and patterns. By contrast, a Pentecost Church expects the Holy Spirit to surprise and delight, and also to provoke and disrupt. She may cause a spontaneous outburst of applause, or tears, or laughter, or an “amen” from the depths of the soul. A Pentecost Church gathers with the expectation that the Holy Spirit will join them, and watches with joy when the Spirit blows through. 2. A Pentecost Church speaks multiple languages. The miracle of the original Pentecost was the ability to share Christ’s good news in all the languages of the ancient world. A Pentecost Church today must speak in the many languages of the modern world. That doesn’t just mean English, Spanish, Creole, Mandarin and Tagalog. 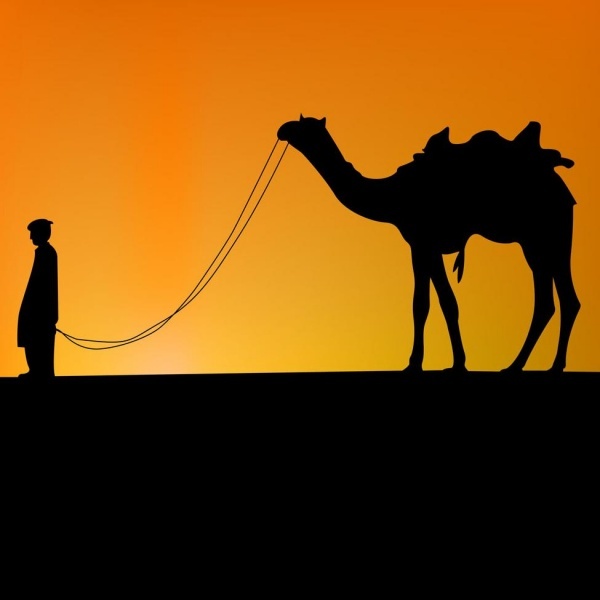 Today’s “many languages” include the language of multiple generations. A Pentecost Church endeavors to deliver the good news to some in traditional worship and bible study, to others via Facebook and Twitter. A Pentecost Church pursues fluency in social media and popular culture, in books and movies and television characters. The church must avoid insider language that is only meaningful to those who already attend (see Rev. Heath’s article for a great explanation of this). While no church can be all things to all people, a Pentecost Church constantly works to translate the good news of Jesus Christ into as many languages as possible, so that everyone can hear it. Their translation breaks down barriers between young and old, rich and poor, in and out, faith and no faith. 3. A Pentecost Church dreams, visions and prophesies. 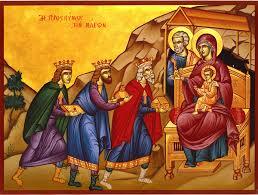 Peter’s Pentecost sermon promises that “Your sons and daughters will prophesy. Your young will see visions, and your elders will dream dreams.” The thing about prophesies, dreams and visions is that they all move forward into the future. A Pentecost Church is not preoccupied with the past—it is captivated by the future. In a Pentecost Church, everybody has dreams and visions for what the church can be and how God will be calling them into bold possibilities. Young people have visions for the church’s future, and they are trusted with the power to execute those visions. Elders do not hold tight to current habits, intent to preserve their way of doing church for themselves. 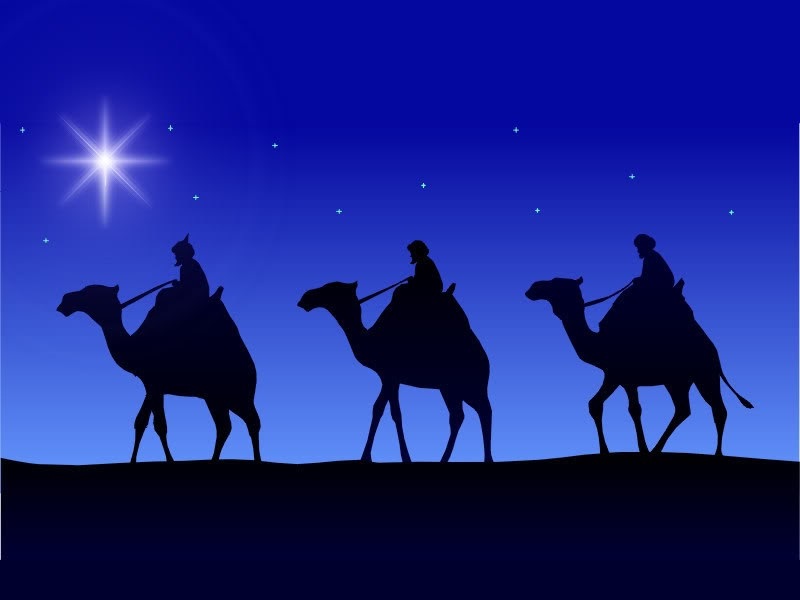 They also dream dreams, foreseeing the church living on without them in ways that are even more beautiful and holy than they could have predicted. By the power of the Holy Spirit, a Pentecost Church faces forward. 4. A Pentecost Church is visible in the community. 5. A Pentecost Church changes lives. When the crowd/community witnessed the Pentecost preaching from Peter, the scripture says they were troubled and wondered what to do. Peter replied, “Change your hearts and lives.” A Pentecost Church is a church that changes lives—of members, newcomers, visitors and community members. The Holy Spirit comes to disrupt and transform us. A Pentecost Church that expects the Holy Spirit also expects people to be transformed by that encounter. A Pentecost Church anticipates that when people meet the Holy Spirit in worship and fellowship, they will be inspired to greater love, kindness, generosity and faithfulness. They will even be moved to abandon their fears, let go of old wounds, practice forgiveness, overcome addiction, and turn their lives around. A Pentecost Church is full of people who have been changed by grace, and continue to be transformed by love. 6. A Pentecost Church seems just a little bit crazy. Changing your life in response to the Holy Spirit, or getting ridiculously happy over seeing someone else’s life changing, or telling people that you have decided to spend your cash and your weekends serving the poor, or spontaneously clapping and rejoicing in worship can seem like strange behavior. That first Pentecost, the crowd declared that the disciples were acting so happy because they had gotten drunk at 9:00 a.m. A Pentecost Church has that kind of joyous intoxication of the Holy Spirit that sparks carefree laughter, unprompted kindness and a willingness to do whatever it takes to share God’s love with the world. Don’t be surprised if a visit to a Pentecost Church leaves you feeling a little high. The Holy Spirit does that. A Pentecost Church is full of Pentecost People. This is the most important mark of all. A Pentecost Church is filled with Pentecost people–people who have been touched by the Holy Spirit, people whose lives have been changed by their encounter with Jesus Christ, people who see visions and dream dreams, people who venture out of closed church doors and into the community, people who speak both the language of God and the language of the world, people crazy with the joyous love of God. The Pentecost Church creates, supports and sends these Pentecost People into the world, carrying the Holy Spirit with them wherever they go, in love and joy. What do you think? Is your church a Pentecost Church? Would you like it to be?